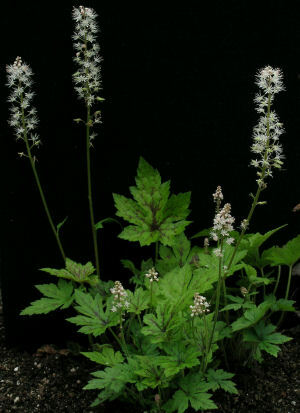 TIARELLA—Foamflower—These are small plants native to the woodlands of North American. 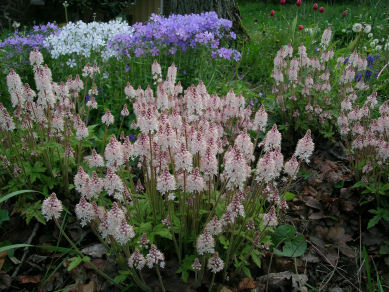 Easily grown in pots or a shade garden, they have fluffy flower spikes 12-16” tall of small, starry white or pink flowers in early spring. Tiarellas may grow as tight clumps or run to form loose mats. 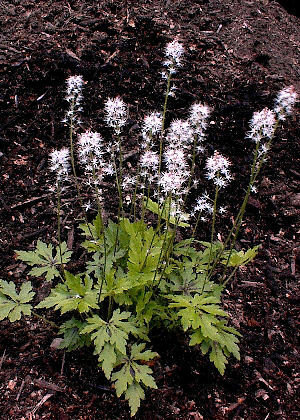 The flowers may be white or light pink. The leaves may be light or dark green, marked with maroon stripes and spots or plain, heart shaped or lobed, shiny or matte. In recent years there has been very active selection of new cultivars in this country. The forms with very cut foliage, like ’Elizabeth Oliver,’ are descendants of hybrids made in the late 1980s at The Primrose Path between eastern forms and a plant from the Pacific Northwest, T. trifoliata var. trifoliata f. laciniata. Many beautiful new garden cultivars have resulted from these hybrids, some very different from any forms found in the wild and much more impressive as specimens. The forms that we offer have been selected for vigor as well as appearance. These plants are all best grown as drifts in shaded, humus-rich soil. 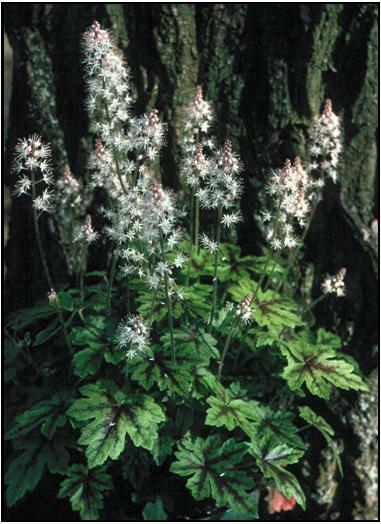 Read more about Tiarella on our Featured Plants pages and in our book. Clicking on the FP symbol next to the descriptive text will open the variety's Featured Plant page in a new window.